I had heard there was an MV Agusta museum about 20 kilometers away, near the helicopter works in Cascina Costa. Judging from the museum’s web site, it was primarily devoted to the aviation business, but there seemed to be quite a few motorcycles on display, too. Like a lot of small European museums, the opening hours were intermittent, but it was supposed to be open from 2-5 pm. All in all, a perfect way to kill a few hours and keep myself awake. ...there are dozens of great motorcycles, including many race bikes and unique prototypes. As usual on such trips, MV Agusta had provided a ride from the airport in Milan to the hotel, and they were scheduled to pick me up on Monday and drive me to the factory. But I was on my own when it came to getting around on this day off. I set off on foot from the hotel, jumping puddles in pelting rain. I counted on finding the train station by dead reckoning. That was more difficult than it should’ve been. Two or three desperate immigrants were sleeping in there, under piles of blankets needed both for an illusion of privacy and warmth. Italians kill time waiting for the train by making out. I accidentally made eye contact with a guy whose expression in the U.S. would almost certainly have conveyed, What are you looking at? But here it was more like, Yeah, she’s cute, isn’t she? They too deserved an illusion of privacy, so I looked off into the grey distance, where a helicopter buzzed. The whole region’s still a hub of helicopter- and aviation-related industry. In Galarate, I grabbed a cab; a BMW that the guy drove as though he’d never heard of aquaplaning. But when we got to the museum, the gates were all locked—even though according to the ‘museum hours’ sign on the gate it should’ve been open. My guide was the museum's motorcycle restorer, Cesare Tobaldo. I guessed that it was possible that if I’d waited, someone would have come to open it but my cheap-o phone plan doesn’t offer European service at all, so I had no way to get a cab to come back. I told the cabbie to take me straight back to the train station. He spoke no English at all, but my Italian’s good enough to understand his suggestion, which was that there was a bigger and better aviation museum nearby that would be open. I told him, No. Again, as we got close to the train station, he pointed out Galarate’s modern art museum. My Italian’s not quite good enough, any more, to communicate that for me, it’s motorcycles or nothing. 40 Euros lighter, I got back on a train to Varese. At that point I opened by backpack for the first time, and realized that while my umbrella had been keeping the rain off me, the backpack and its contents were soaked. Luckily I’d pulled almost everything—especially my passport—out of it. Damage report: a half-filled Moleskine and the Italian-English dictionary I bought way back when I was writing ‘Searching for Spadino’. I had another long walk from the train station back up to the hotel, at which point I was happy to take a long hot shower and install myself in the hotel bar. The next day while I waited for my interview appointment with Castiglioni, I told MV Agusta’s PR director, Alessia Riboni, my ‘museum was closed’ story. After my talk with the boss, Alessia came back to show me out and said, "Our driver will take you to Gallarate, drop you at a roundabout where Giovanni Magni will pick you up and take you to the museum"
Alessia: "They're opening it for you." Giovanni parked, and called someone on his mobile. An old gentleman, Cesare Tobaldo, appeared at the door, recognizing Giovanni, he unlocked it and let us in, then locked it again behind us. Perhaps I’m too Canadian, because that kind of special treatment is a little embarrassing to me. Tobaldo apologized; the museum should have been open when I’d arrived on the previous Sunday afternoon. But that morning, the museum had a big group come through, and the staff were not able to shoo them out in time to close for lunch at noon. Since no Italian can properly eat a Sunday lunch in less than two hours, they decided to reopen the museum at 2:30. I had arrived in the interim. I got over my embarrassment when I realized that the museum has a much bigger collection of bikes than I expected, and I was getting the ultimate private tour, accompanied by Giovanni Magni (whose dad Arturo had been Giacomo Agostini’s lead mechanic, and who is himself a leading restorer of MV Agustas) and guided by Cesare, who it turns out is the museum’s own restorer. He came in just for me, on his day off. Cesare worked as a fabricator in the helicopter factory for decades. The motorcycle race shop was also located there in Cascina Costa, not at the nearby motorcycle factory in Verghera, for several reasons: the Count’s office was at the helicopter plant, and he liked to keep an eye on the race bikes in development; Arturo Magni, the race team manager could take advantage of the plant’s advanced fabrication capabilities; and the layout of the plant made it possible to move race bikes on and off the property even if the factory was being picketed by strikers, which was a common problem in Italy in the 1960s! ’47 Duecentocinquanta – This 250cc pushrod single had an unimpressive production run of about 100 units in the late ’40s. The museum has a lot of race bikes from the 1950s through the ’70s and scores of production models that I was unaware of, including scooters and trail bikes. Many of the displays are prototypes, so the information placards carry two dates; the year the one on display was made, and the date – a year or two later – when this model was raced or produced. 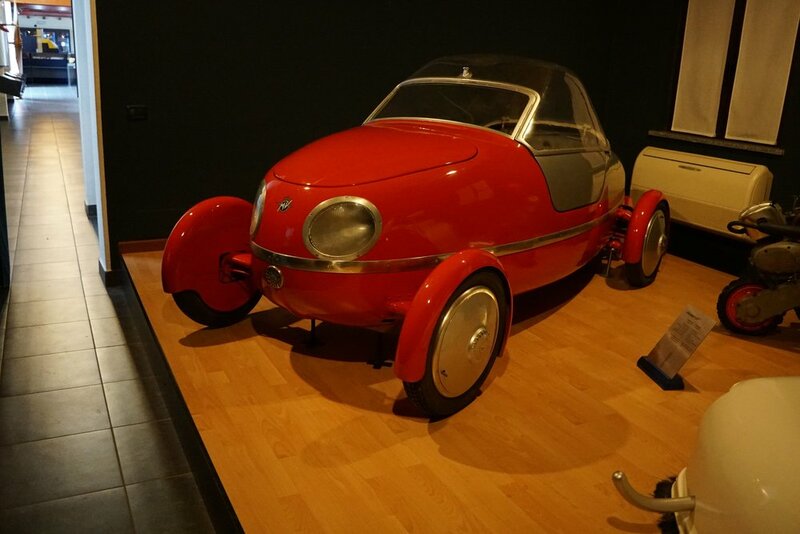 There are also several wild and wonderful prototypes that were never raced or that never made it into production, including a stylish microcar and a working hovercraft! If you love motorcycles, Museo Agusta is ‘worth the detour’, as they say in the Michelin Guide. Admission’s a bargain at €2.50. And of course, if you’re a particular fan of MV Agusta and its storied Grand Prix history, this collection’s your Mecca. There are, of course, also many exhibits devoted to the Agusta helicopter business, including a helicopter simulator which established, if nothing else, that I’m a better rider than pilot. ’54 175 CSS – 175cc, SOHC, four speeds. About 500 were made like this, with the characteristic ‘flying saucer’ fuel tank and Earles fork. ’54 175 CST – 175cc, SOHC, four speeds. This commercially successful machine was produced in several different versions (some with 17” wheels and some with 19”). ’55 Bicilindrico Corsa Prototype – Fascinating space frame and front suspension. This was a project by an MV engineer named Giannini. The 350cc twin was tested but never raced. 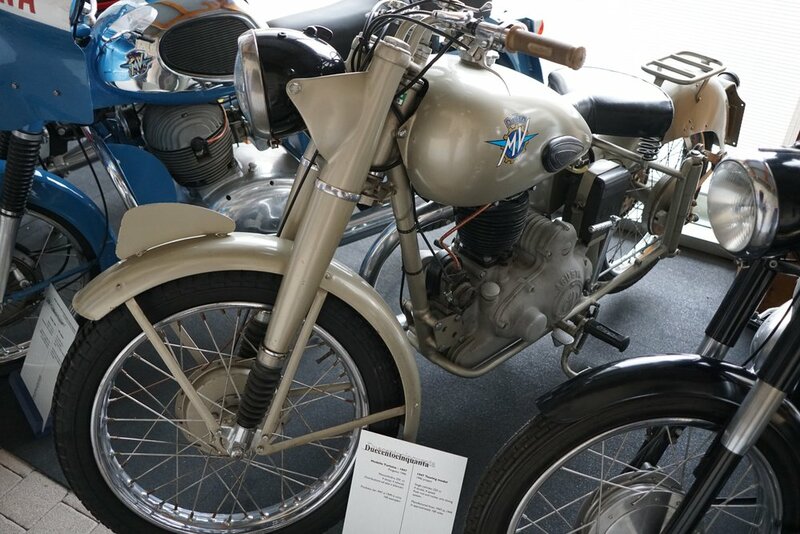 1955 prototype 125cc ‘Pullman’. 125cc, 2-stroke, 3 speed. This was a commercially successful road bike. MV Agusta sold 9,000 units with a twistgrip gear shift in 1953, then 27,000 units with foot shift over the next two years. ’56 250 Monocilindrico Corsa – 250cc single, DOHC, five speeds. Bill Lomas delivered the first GP win for this elegant machine at the 1955 TT. ’56 350-4 – This 350cc four-cylinder is of the type raced from 1953-’63. DOHC, five speeds, 51.5 hp @ 11,000 rpm. Mike Hailwood delivered the last victory for this model at the scary old Imatra circuit in Finland, in 1963. ’62 Chicco scooter – This is a 1962 developmental prototype for a model that was fairly successful, selling 3,000 units from 1960-’63. It has a fan-cooled 155cc 2-stroke motor with 4 speed ’box. 1964 ‘Arno’ prototype. 166cc pushrod twin. Five of these prototypes were made, leading to a 250cc production model in 1966. 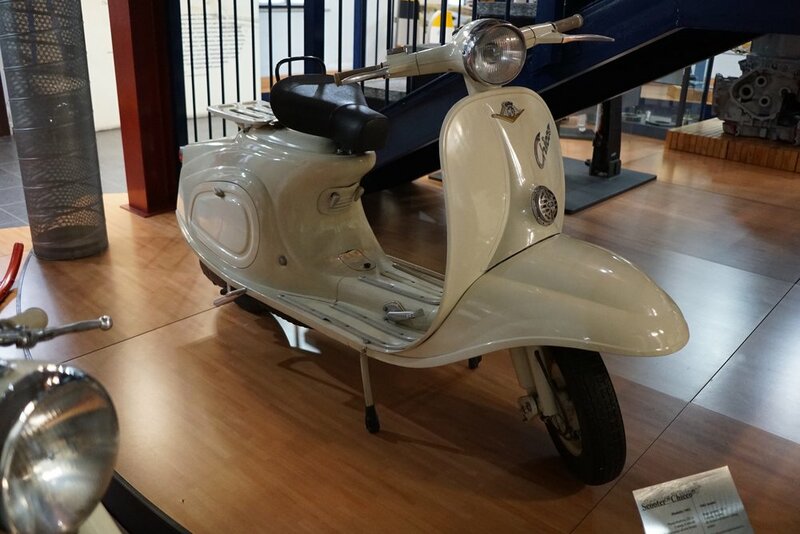 ’64 Germano – 48cc, 2-stroke, three speeds. MV Agusta sold a total of more than 1,700 of these mopeds. The ‘Germano’ was made in two versions, one seen here with a pressed-steel frame and another with a tube frame. MV brought the motors in from DKW. ’68 600 4C6 – This 600cc road bike was made with a shaft drive in order to ensure that it would not be raced by customers! It was not particularly successful, with only 127 machines known to have been made between 1968-’71. 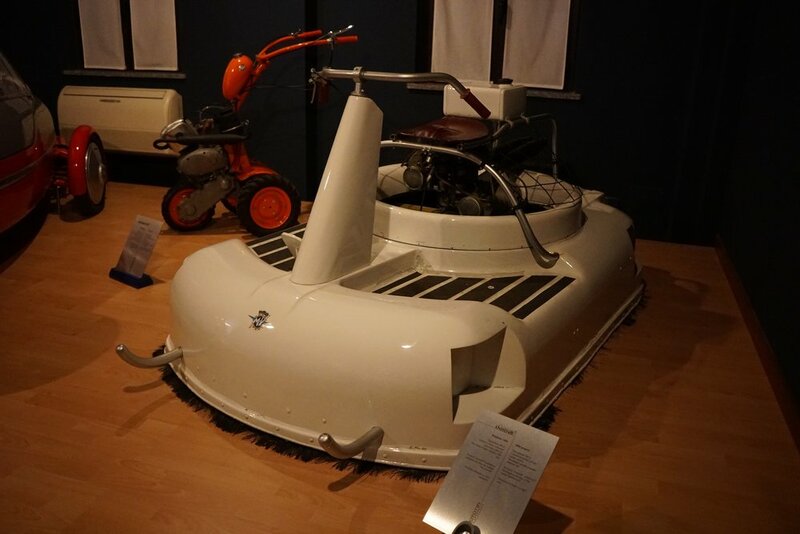 ’69 Prototype Hovercraft – This 1969 full working prototype was powered by a 300cc two-stroke boxer motor. ’75 750 America – 750cc, DOHC, five speeds. The shaft drive and electric start were attempts to position this as a viable choice for a gentleman’s road motorcycle. About 500 were sold. Sorry, I can’t find my notes on this very stylish disc-valve two-stroke twin. IIRC, Cesare told me that the machine never had any internals; MV showed it at EICMA but didn’t get enough orders to justify continued development. The museum includes several elegant little scooters – an aspect of MV Agusta’s production I knew nothing about. If you dug this deep dive into moto-history, you'll probably also like my book, 'On Motorcycles: The best of Backmarker' available here on Amazon. If you love the history of our sport, you'll find a lot to enjoy in this book, and by buying a copy right now, you'll help me to continue creating new content. Click the cover image to go straight to my Amazon sales page, or read it for less than $10 right now, by downloading it on Kindle here.